The Chabad movement distinguishes itself from other trends in contemporary Judaism by its practical activities in hundreds of areas through hundreds of means. It is difficult, if not outright impossible, to decide which of these activities is the most important. However, if someone were to ask, "If you look at the sum total of Chabad activities and existing institutions, which of them is the most vivid reflection of the Chabad spirit and the most tangible embodiment of the Rebbe's instructions?" we would answer without hesitation: the shluchim, or emissaries. Who is a Chabad shaliach? A young man is studying at a yeshiva. In time, he marries. Later, with G*d's help, the young couple has a baby. Then, a year after the wedding, the Rebbe' s secretary summons him, and the young man knows that his time has come. "Listen, Itzik (or Moshe, or Eliyahu), there is a little town in Chili called Surmalulu, which has a few hundred Jewish families in danger of total assimilation. If we con­tinue to sit idle, it won't be long before these families are lost to our people. They will simply disappear - dissolve into the gentile population. So take your wife and son, go to Surmalulu, and get down to business. For how long? As you yourself know, our work is never done, so, until Mashiach comes. That will be all." "All? Hold on a minute. Where is this Surmalulu? How does one get there? Does the place have a synagogue?" "What about a mikveh?" "No mikveh." "A Talmud Torah?" "Of course not." "Can one obtain kosher food there?" "You would have to go to the capital, three hundred kilometers away. There you can get kosher food." "Is there at least a minyan in Surmalulu?" "Possibly on Yom Kippur, but even that is not cer­tain. This is where you come in," explains the secretary. "You will open a Chabad house in Surmalulu, which will have a synagogue, a Talmud Torah, a mikveh, kosher food, everything. You will have to ensure that the Jews of Sur­malulu begin to pray and put on tefillin, that their children learn the holy language, and most importantly, that they have a house where they will be able to find out, perhaps for the first time in their lives, the meaning of love for the peo­ple of Israel. This will rekindle their Jewish spirit. This is your mission." "This is all very well, but I will need funds to perform this mission." "You will have to raise the funds by yourself, from private donors and various foundations." "But I will at least need some money to live on." "Well, during the first year we will pay you something for your living expenses, but after that you will have to earn your own living and raise the funds for running the synagogue, the educational institutions, and everything else you will have set up." "But they speak Spanish in Chili, and I don't know a word of Spanish." "You will pick up some Spanish here - sign up for an intensive course, and the rest will come once you are there." Naturally, anyone else would tell the secretary, "Find another candidate. How can you possibly expect me to just throw everything to the winds and go to the middle of no­where at the other end of the world? If it were for a year or two, all right, fine, I might consider this suggestion, but a lifetime commitment? This is really too much!" This is how a polite man might answer. Someone less polite would sim­ply get up and leave. A Chabadnik who is entrusted with a task by the Rebbe himself is a different matter altogether. Such a person has been taught to sacrifice everything for the sake of serving G*d and helping his fellow Jews, as the Rebbe expects. In fact, he is prepared from birth for just such a moment, when he is finally called upon to fulfill his mission. When the moment finally comes, he is proud and happy to have been singled out; the only question he asks is "When?" Of course, he will discuss the matter with his wife, even though he knows in advance that she too will be filled with pride and joy at the turn of events. Thousands of Chabad emissaries perform their mis­sion in every corner of the world: in Israel, the U.S., Mo­rocco, Australia, New Zealand, Italy, England, France, Hong Kong, Argentina, South Africa, Peru, Brazil, Ecuador, Columbia, Tunis, Belgium, Austria, and countless other countries, including remote locations in the former Soviet Union that were largely unheard of in America and Israel until the collapse of communism. The shluchim are active in communities numbering thousands of Jews, as well as in towns that have several dozen Jewish families at most. In this, they follow the Rebbe's teaching: "Every Jew is an entire world. It is our duty to care for each and every Jew. If a Jew becomes as­similated, G*d forbid, it will be on the conscience of every one of us." The Rebbe also says, "No Jew is ever irretrieva­bly lost. Even someone who has become hopelessly alien­ated from Torah and commandments and seems to have to­tally abandoned our ancestral legacy still retains the divine spark deep inside his soul. It is our duty to rekindle that spark. There is no room for despair. There are no hopeless Jews, just as there are no limits to the devotion with which we must serve our cause." 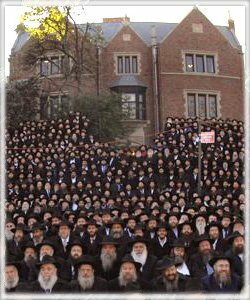 The Lubavitch movement has close to four thousand Chabad Houses throughout the world. In addition, Chabad runs special women's organizations, and a worldwide chil­dren's organization called "G*d's Armies." Each Chabad school, Talmud Torah, yeshiva, kollel, library and publish­ing house functions as a bulwark in the campaign to return Jews to Torah. In the mid-1980's, the Rebbe launched a campaign to make the home of every observant Jew into a true Chabad house - a focal point for bringing Jews together and return­ing them to Torah. As a result, there are tens of thousands of such Chabad "family homes" the world over. An emissary has to surmount countless obstacles, one of which is financial. In order to fund his activities (includ­ing his own salary), the emissary requires a sizable budget. Where does he find the money? The emissary has to learn how to "activate" the people who are in the process of re­claiming their Jewish identity. These people, who have only recently been introduced to the world of Torah and Chassi­dism, are given the privilege of fulfilling a noble mission ­like the ancient tribe of Zevulun, whose financial acumen enabled the tribe of Issachar to devote itself to Torah study and worshipping G*d.
An emissary's task is to rekindle the unquenchable fire of holiness. To do so, he must combine two almost ir­reconcilable qualities: practicality and spirituality. He must have the capacity to attract people of every sort, and the willingness to embrace life in all its aspects, including some he was probably totally unaware of while studying in ye­shiva. He has to become familiar with areas that have been completely beyond his ken until now: literature, art, busi­ness, economics, politics, social sciences, etc. Moreover, he must learn to retain his unique identity as a Chassid even after he enters the secular world. Otherwise he will never succeed in his endeavors. Here, for example, is the story of Rabbi Mendel Lip­skar, the Rebbe's emissary in South Africa. "When I came to Johannesburg fifteen years ago, there were very few Chabadniks there, barely enough for a minyan. Upon arrival, I was miraculously appointed as rabbi in a small synagogue. The city had a well-organized Jewish community; however, it was not overly meticulous in the observance of commandments. No wonder that Jews were assimilating at a rapid pace, with mixed marriages becom­ing a common occurrence. My synagogue had a very small congregation. I contacted all the Jewish schools, and I began to teach Torah. Next I came to the local university and be­gan to organize Jewish students on campus. To my surprise, I received a warm welcome everywhere. Evidently the Jew­ish spirit had not yet been extinguished. At times it seemed that people were just waiting for someone to come and wake them up. Of course, this was far from easy. The process was very slow; many Jewish leaders viewed me with a great deal of skepticism. Some of them suspected that I was trying to replace them; the school principals were initially afraid that I was scheming to win over their students. Still, with G*d's help, I managed to overcome every obstacle." The results speak for themselves. Fifteen years after Rabbi Mendel Lipskar started his activities, Johannesburg had four Chabad centers, a Jewish school attended by eight hundred students, a yeshiva, and a women's college. Today, Johannesburg has rabbis, Torah scribes, kosher butchers, mohels - a vibrant, full-fledged Jewish community. The Lubavitcher Chassidim have their own newspaper, as well as a radio station that broadcasts one hour a week across South Africa. Naturally, Rabbi Mendel Lipskar is no longer alone; another twelve emissaries work side by side with him. "What has helped me the most?" muses Rabbi Men­del. "Definitely the Rebbe's advice and unflagging support. For example, we had a serious problem in South Africa: many Jews wanted to emigrate due to the tense relations between whites and blacks. However, the Rebbe's instructions were emphatic: one does not leave the field of battle, which was South Africa in this case!" With time, the Johannesburg success was echoed by the creation of a parallel Chabad "empire" in Cape Town, the second largest city in South Africa. Each week, each shaliach writes a report for the Rebbe, describing all that has been done during the week. The letters report on the number of people attending the Jewish school in Casablanca, the amount of money needed to complete the construction of a Chabad house at the Uni­versity of Los Angeles, the progress of third-grade pupils in a Jewish school in Marseille, the shechita situation in Bo­gota, and thousands of other major and minor matters. There is something new every week. The Rebbe remembers every­thing, and sends his reply, offering advice and help with pressing problems. One striking element that distinguishes Chabad from other large organizations is that the Rebbe receives his in­formation directly from his emissaries, and guides their ac­tivities just as directly, without intermediaries. Most other organizations are guided by an official hierarchy: the work­ers pass on information to their low ranking superiors who, in turn, process this information and pass it up the pyramid to the senior bosses, and so on up to the head of the entire organization. Instructions are transferred in the reverse or­der, from top to bottom following the same route. The Rebbe's organization, on the other hand, has no middle management. The connection is direct: from the Chassid to the Rebbe, from the Rebbe back to the Chassid. This enables the Rebbe to stay attuned to the minutest details of the successes and problems of each community and each Jew. That caliber of leadership is certainly unique and unparal­leled. Many interesting stories could be told about the Cha­bad houses in the cities of Southern and Southeastern Asia. These houses serve the flood of young Israeli men and women who, after their army service, head for Nepal, India, and other places in search of "exotic spirituality." Many of them fall prey to gurus, Buddhist sects, and so on. The es­tablishment of Chabad houses in Thailand, Nepal, and later in India did a great deal to minimize the damage of this un­fortunate phenomenon. The houses run kosher restaurants and synagogues. Passover Seders for thousands are arranged out in the open. Suddenly a stray soul lost in an alien envi­ronment begins to feel the warmth of a Jewish home, and realizes that spirituality should be sought not in the Himala­yas but in Jerusalem, Hebron, Tiberias and Tzfat. After the collapse of communism, Chabad houses be­gan to spring up like mushrooms in Dnepropetrovsk, Kazan, Orenburg, Krasnoyarsk, Khabarovsk, Irkutsk, and other cit­ies in the former Soviet Union. Of course, hundreds of new Chabad houses open each year in the United States, particularly near universities at­tended by thousands of Jewish students. Why do the Rebbe's emissaries succeed where others have failed? Obviously the main reason for this success is their wholehearted dedication. They put their hearts and souls into the work they do for the good of the people of Is­rael. Most of them incur large debts in the process, yet this does not deter them from the task. The importance of the mission they have been entrusted with by the Rebbe fills their awareness to the extent that it does not even occur to them that what they are doing is something totally contrary to ordinary human logic. They are ready for anything, and they do not perceive their work as self-sacrifice. On the con­trary, they are convinced that they have earned a great privi­lege. Hundreds of thousands of Jews lived in Paris follow­ing World War II, but only a few of them remained true to the Torah and the commandments. Even those who still re­tained some fear of G*d put Him aside, as it were, until more propitious times. Yet Paris, like any other place, had a handful of Chabad activists. Rabbi Mulya Azimov headed them. In 1963, he visited the Rebbe and received his bless­ing. At the very end of the audience, as Rabbi Mulya was heading for the door, the Rebbe suddenly said, "You are destined for great success, unprecedented success." True enough, from that time on Rabbi Mulya has been blessed with incredible success. Through his efforts, thousands of Jews - previously secular in every respect - have been transformed into full-fledged Chassidim. Initially, Rabbi Mulya acted alone. Later like-minded individuals joined, who, in turn, attracted others, eventually forming a core of fifteen people. This group accomplished a virtual revolution in the life of French Jewry. The Paris Jew­ish community not only did not disappear, it has been get­ting stronger with each passing year. Today Paris has restau­rants as kosher as the ones in Jerusalem. There are also schools that provide a full Jewish education. The parents studied in universities but after returning to a Torah­ observant lifestyle, they fully realize the crucial importance of religious education for their children. Each week, hundreds of Torah lessons are taught on every level; a Jewish radio station broadcasts a daily three-hour lesson on Torah and Tanya, even though Jews who have not yet become observant run the station. Incidentally, all of the Rebbe's farbrengens are broadcast on this same station, reaching three hundred thousand Jews throughout France. In a remote provincial town in France, Rabbi Mulya Azimov managed to form a small community of several families that had become observant. There was a problem, however: Rabbi Mulya had urged them to take strict precau­tions to ensure that their children drank only kosher milk. (If a gentile milks a cow, the milk is considered kosher only if a Jew was present to observe the milking. Nowadays only deeply religious Jews, including Lubavitcher Chassidim, observe this law). The families objected to this stringency. It was impossible to obtain such milk in their town. The adults were willing to give up milk altogether, but how could they deprive the children of milk? Rabbi Mulya did not lecture them and did not make a problem out of the situation. Twice a week he set out from Paris, loaded with two large contain­ers of kosher milk, on a lengthy train journey to personally deliver this milk to the Jewish families. When the goal is plain and clearly defined, there are no insurmountable ob­stacles. On the other side of the world, in Australia, Chabad emissaries headed by Rabbi Yitzchak Groner have established a "Jewish empire." The beginning was slow. At times it seemed that Judaism was doomed to extinction in the land of the kangaroo. Yet the Rebbe's emissaries persisted in their efforts; like soldiers bravely performing their duty, they tackled the difficult task at hand, and their eventual success exceeded all expectations. Today the country boasts yeshivot, mikvaot, synagogues, koliels, and Jewish schools for young and old. In 1957, Rabbi Hershel Tzvi Gurman was sent to London as the Chabad emissary. Together with Rabbi Ben­zion Shem Tov, he purchased a house in the Stamford Hill neighborhood, which had a large Jewish population. They started with a minimum, opening a cheder for children and holding the minyan there. In 1959, Rabbi Nachman Sudak ­the Rebbe's itinerant emissary - arrived in London. He opened a bookstore specializing in holy books, and began to teach. Rabbi Hershel Tzvi Gurman devoted himself to orga­nizing children's summer camps. In 1960, another emissary - Rabbi Faivush Fogel ­came to London. He began raising funds, and soon collected enough money to construct the building that presently houses a school for boys, a school for girls, a beit midrash, offices, and a gymnasium. Another emissary, Rabbi Shmuel Lou, organized To­rah classes in the famous universities of Oxford and Cam­bridge. Obviously, the sight of bearded Jews wearing black Chassidic garb was highly unusual in these venerable insti­tutions. Still, it is an undisputable fact that Rabbi Shmuel succeeded in introducing Torah studies there. At the same time, the women's movement was gaining strength in England. The Chabad Women's organization concentrated its efforts on children's education, kashrut, and explaining the laws that pertain to the sacred institution of marriage and family life. Despite the challenge of raising many children (often ten or fifteen, and in a few cases even twenty), the women would not miss an opportunity to bring five or ten additional guests to their Shabbat or holiday ta­ble. The Chabad Women's and Girls' conventions are suf­fused with the spirit of ahavat Yisrael - unity, devotion to the Rebbe and Torah, and they give energy and motivation to the participants for many subsequent months. The high­light is, of course, the convention in Crown Heights, which includes a women's farbrengen at "Seven-Seventy" dedi­cated to hearing Torah instruction from the Rebbe himself. The Rebbe emphasizes the sacred mission of the Jewish woman based on the fact that the Torah assigns greater re­sponsibility for educating the next generation to women than to men. The Rebbe's emissaries never wait for others to come to them asking for help in becoming Torah-observant Jews. "We have to generate demand," explains Rabbi Gur­man. "We actively reach out to lost Jews. In Chabad homes in London and Manchester you can find students who were recently inveterate drug addicts. Their parents had given up all hope - but we had not. On Friday afternoons, these ye­shiva students go to the center of London to put tefillin on hundreds of tourists and businessmen." Today there is a dynamic and diverse Jewish life in London. Chabad houses are also operating in Manchester, Birmingham, and Glasgow, Scotland. Every year, graduates of American Chabad yeshivot head for Eretz Yisrael both as immigrants and emissaries. They establish both new settlements and Chabad neighbor­hoods in existing cities. A Chabad neighborhood was set up in Tzfat, which is called by some the city of Kabbalah, or the city of the Holy Ari. Rabbi Aryeh Leib Kaplan founded that particular neighborhood in 1974. Today it boasts schools, cheders, kindergartens and mikvaot. Every year Rabbi Aryeh Leib Kaplan brings dozens of immigrant fami­lies from the United States to Tzfat; they settle in the city, and devote themselves to the welfare of the Jewish people in Tzfat and throughout the Land of Israel. We have mentioned only a few of the large-scale en­deavors carried out by the Rebbe' s emissaries, all of them crowned with unprecedented success. However, many lesser projects are being implemented in small communities, in cities with only forty or fifty Jewish families. These small communities are often doomed. With no rabbi, no syna­gogue, no mikveh, young Jews marry gentiles, and the community fades away within a short time. Unfortunately, this has been the fate of hundreds of Jewish communities in South America, the United States, and Europe. This was the situation until recently. Now, however, the number of such tiny communities is growing each year. The Rebbe's emissaries to these communities arrive with their families, with no money, bringing only the most basic household items. The young Chassid, accustomed to the hothouse atmosphere of a tightly knit Jewish community of Torah-observant Jews, suddenly finds himself transported to an environment that seems like a barren desert. There is no minyan, no mikveh, no synagogue, and it will probably be weeks until his family will obtain kosher meat. With time, however, he succeeds in gathering a nu­cleus of people around himself, which will eventually be­come a full-fledged Chabad community. The community will grow and flourish, until yet another colored pin will ap­pear on the global map of Chabad communities. This educational and organizational process involves, directly or indirectly, the emissary's entire family. Chabad women and children are equal partners in the outreach proc­ess. They are role models, teachers, and emissaries in their own right, who share in the joy of accomplishment as they see the Jewish community grow. This section cannot contain even a fraction of the amaz­ing and wonderful accounts that deserve to be told about the shluchim. For example, we could have recounted the story of Rabbi Shlomo Cunin who, during his twenty years in California, managed to transform a spiritual desert into a veritable fortress of Judaism. In the resort city of Miami, Rabbi Shalom Lipskar's speaking and organizing abilities resulted in hundreds of lost young Jews embracing the To­rah and Jewish values. He also created a "correspondence yeshiva" for Jewish convicts incarcerated in local prisons. Impressed by the astounding achievements of Cha­bad, other Jewish movements followed its example of spreading Torah among assimilated Jews, helping them re­claim their Jewish identity and embrace the Jewish faith. All of them make use of Chabad's unique experience and meth­ods. However, there is a significant difference between Chabad emissaries and representatives of other movements. Chabad emissaries do not try to insulate the Jew from his accustomed environment. Their objective is to bring the Jew to change his way of life and thinking while remaining in his own surroundings. They do not try to uproot him from his native soil and replant him in a yeshiva or a religious neighborhood. In Chabad terminology, ufaratztah means to remain a Jew anywhere, without segregating or secluding oneself. In other movements, the return to Jewish faith is of­ten accompanied by changing jobs, breaking with friends and family, and abandoning one's profession. Not so in Chabad, which brings Judaism to Jews whoever and wher­ever they are. Jewish commandments and customs must penetrate into his life until he becomes truly observant. As the Rebbe says to his emissaries, "Until Mashiach arrives, build a spiritual Jerusalem wherever you find yourself." Assimilation continues to deal terrible blows to the Jewish people. To our deepest regret, we lose dozens of Jewish families every hour, and the number of Jews is steadily decreasing. Without the Rebbe's emissaries the pic­ture would be much more dismal. Thank G*d, their number increases from day to day. Nowadays, there is no place on the face of the earth, including the most remote comers of Siberia, which has not been reached by these emissaries. There is no doubt that the day is not far when the concerted efforts of the Rebbe's emissaries will succeed in stemming and reversing the flood of assimilation.